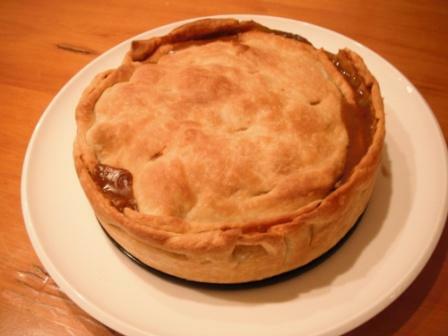 In the middle of winter, nothing hits the spot better than a meat pie….a crispy homemade pastry encasing a thick rich saucy casserole. This is simplest pastry recipe I know. Rub 100gm of butter into 200 gm flour. Add in enough iced water to make a dough (about 3-4 tablespoons). I used steak and kidney cooked in red wine and beef stock with garlic onion and the obligatory carrots and peas. Serve with creamy parsnip or potato mash.